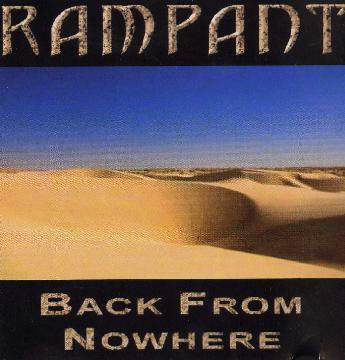 Rampant - "Back From Nowhere"
Rampant were a melodic Swedish hard rock band that started in 1985 and made some demos and played a few gigs and then disappeared. In 2001, the former members had an idea to try to pull it all together again and the band recorded a bunch of their old as well as new songs over the next 3 years. The CD was finalized in 2004 and 2005 and finally released privately by the band. Rampant is one of many bands that Juba (ex-Darxtar, Pseudo Sun) has played in over the years. Ok... what about the music?. This is very high quality 80's style melodic hard rock heavy metal with dual guitars, bass, drums, vocals and keyboards but it is mostly guitar rock! It is amazing to hear music like this made in 2005 as it is such a throwback to another era of rock but done very well. For more information you can visit the Rampant web site at: http://www.rampant.se.